This delicate vine from Colombia could also be called the "Climbing Alstroemeria" as it is closely related to these beautiful Peruvian lilies. 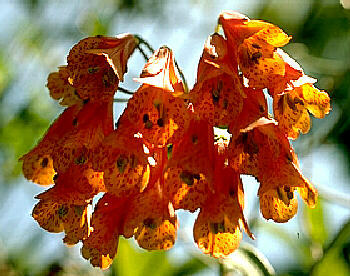 The spotted orange flowers can appear at any time but primarily in the spring. This plant is hardy to at least 20-25 degrees F. Give abundant water in dry months. Sadly, we are no longer growing this plant.